Appallingly, Ben and Jerry’s has given the public a new reason to not buy their fat-and-sugar-laden and unhealthy ice cream: A new Ben and Jerry’s flavor called “PeCAN Resist” supports unsavory hate-promoting, violence-promoting, anti-Semitic political groups, including: the Israel-bashing “Women’s March” along with its Jew-hating, violence-promoting, anti-Israel boycott-promoting leaders Linda Sarsour and Farrakhan associate Tamika Mallory; “Color of Change,” which is running a campaign promoting Maxine Waters’ call for harassment and incivility; and a subsidiary of “Progress Texas” which is demonizing pro-Israel Senator Ted Cruz as a subhuman monster. This is frankly sickening and frightening, especially so soon after the Pittsburgh Synagogue massacre and other appalling anti-Semitic and violent incidents. It is deeply painful that Ben & Jerry’s heads Ben Cohen and Jerry Greenfield – who are Jewish – are promoting, financially supporting and taking a smiling picture with Jew-haters such as Linda Sarsour, who promote massacres (the intifada) and boycotts against Ben & Jerry’s fellow Jews. Moreover, the biased Women’s March “Unity Principles” protect Muslim women and certain others – but not Jewish women. Further, when two Jewish actresses were scheduled at the Los Angeles Women’s March, Palestinian-Arab groups boycotted and maligned them, Sarsour endorsed this boycott, and the boycott “inspired” a raft of anti-Israel speeches at the L.A. Women’s March. In addition, the virulently anti-Israel “Ahed Tamimi Contingent,” including leading anti-Israel boycott groups JVP and Adalah-NY, was part of the New York January 2018 Women’s March, and held up signs and made vile statements celebrating Palestinian-Arab terrorist Ahed Tamimi; opposing the presence of Zionists in the Women’s March; saying “Zionist feminism is a contradiction in terms” and “Zionism historically and today is immersed in racism and white supremacy”; and even comparing Zionists to the KKK. Women’s March leader Linda Sarsour’s lengthy, vile record of anti-Semitism, attacking women, inciting violence and terror attacks against Jews and Israel, and promoting anti-Israel and anti-Jewish boycotts, is described at the end of this article. 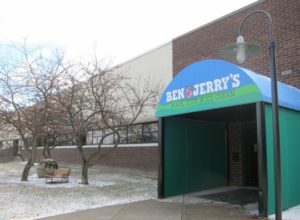 Unilever Ownership: Since 2010, Ben and Jerry’s has been owned by Dutch company Unilever. The many persons who have tweeted that they will no longer purchase Ben and Jerry’s, and will instead switch to another brand, may wish to bear in mind that Unilever also owns ice cream brands Breyers, Magnum, Klondike, Popsicle, and Ice Cream Makes U Happy. Unilever also owns popular food brands Hellmann’s, Lipton, and Knorr; and personal care brands Vaseline, Tresemme, Noxzema, Ponds, Dove, Nexxus, Q-Tips, Suave, St. Ives, and Lever 2000. “Nutrition” Info: A 16-ounce pint of Ben & Jerry’s “Resist” Ice Cream has an enormous 1,200 calories, 80 grams of fat, 44 grams of saturated fat (more than double the recommended saturated fat daily maximum), 200 mg of cholesterol (over 2/3 of the daily amount), and 100 grams of sugar (which is quadruple most people’s entire recommended daily maximum of sugar). Interestingly, Ben & Jerry’s misleading label lists the nutritional facts for an unrealistically small half cup (4 ounce, or one-quarter of a pint) serving. We used this label to calculate the pint serving amounts. In 2016, the FDA ordered ice cream companies to list nutrient data in a dual column format, for realistic 2/3 cup and full-pint servings. Ice cream manufacturers delayed the FDA’s compliance deadline from July 2018 to January 2020.